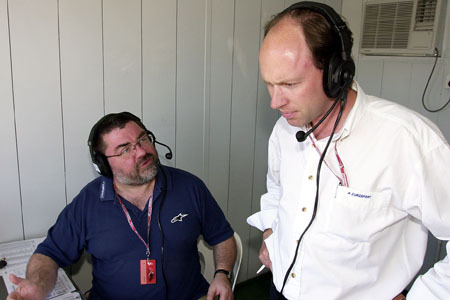 Standing next to co-commentator Julian Ryder, Eurosport's MotoGP commentator, Toby Moody, on loud pipes, property development and his lust for the BMW K1. 1. If you were a bike, what would you be? Honda 250 six-cylinder. Medium sized, but loud. BMW K1. Oh my God, what have I said... I'm sorry. 4. What were you riding and where when you first topped 100mph? 6. What's the fastest you've ever ridden on a public highway? Ride to my girlfriend's house with the can off a 600. Hoon flat out, hearing it popping and banging, and feel it spitting flame. 11. What bikes would you like to own if money were no object? Honda V5, Ducati 999R, BMW K1200R and a KTM something. 12. What's the maddest thing you've done on a bike? A 100mph+ tankslapper with jeans and Timberlands on. People saying they enjoyed a commentary. 17. Do motorcycles inform your work, and if so, in what way? 18. If you could switch careers, what would you do?